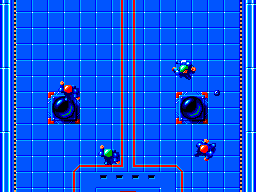 Speedball is a direct port of the Amiga game released in 1988 by Image Works and developed by The Bitmap Brothers. The game was, and somehow still is, pretty unique since it's a futuristic arcade sport with the added value of violence. The amiga version was great visually and sound-wise, while being very funny although a tad repetitive. How could The Bitmap Brother squeeze all of this in a tiny cartridge for the SEGA 8-bit console? Let's see! The game is very simple, it's a futuristic version of handball where you can violently tackle the opponents and get away with it. Right, there are no fouls or referee decisions on the matter, so the game plays very smoothly without interruptions. The overhead visual lets you see a wide area of the playing field. The 2 goals are located in the upper and the lower side of the field, and at your left and right sides you will find 2 tunnels that warp the ball to the opposite side from where you threw it. On the field you will also find 4 bumpers that...well, bump the ball around disrupting the game action. When you first start your game you have 3 options, an unenthusiastic demo mode, one player knockout and two player league. Needless to say, if you want a single player game you have only one option where you face each of the 10 opponent teams in a best of 3 tournament. After you make your selection you will have to choose between 3 teams, each with different stats. During your match you will find different items appearing randomly on the field, coins or power ups with different effects, like freezing the opponents, reduce your opponent's stamina or turn the ball into a weapon, all for a limited time. After every game you can raise your team statistics by buying permanent power ups for your team, lower the stats for your opponents or bribing referees and officials. Right, you heard it! Bribing can make you start the next game with a 1 goal lead, play an extra time if you are losing or giving you more time when you pick up any powerups. You won't find too many coins, so you might want to take seriously how you spend them since the team you are going to face will be stronger and stronger. The graphics during the match are detailed enough for an overhead sport game, although it plays choppy and a lot slower compared to the home computer versions. For a game called SPEEDball, this sounds like a nuisance, but in my opinion, doesn't make the game totally unplayable. 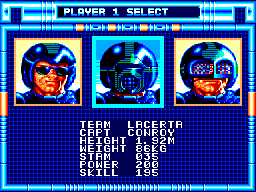 The title screen and the menu are again a copycat of the home computer versions, and they are clean and readable, with the team captains very well drawn on our beloved 8-bit console. What I misses the most is a HUD showing the remaining game time and the player energy left, but you can still see the time remaining on the bar appearing on the right side of the field. The main theme is still here, average for Master System standards, but it's obviously several steps down compared to the original. You will only hear it during the title screen, the menu is almost completely silent, there's a short music bit before every game, and again, no music during the game, only a tiny bit of thuds and clashes. Not even some crowd sounds! The audio part could have been done a little better to make the game feel more lively. The controls are extremely easy and responsive, only one button and you move your selected player with the D-Pad. Without the ball you use the button to tackle, or catch a high ball. With the ball you can pass or throw it low or high depending on how long you keep the button pressed. You also control the goalkeeper when in sight that can be moved left and right. Nothing too complex and keeps the game very simple as soon as you play it for the first time. With only one single player mode the game will only last as long as it takes you to beat it, probably some hours. 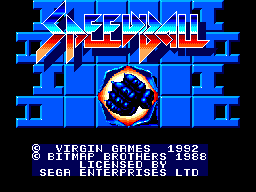 Speedball misses the league mode that was present in every other port, even on the C64 and the horrible NES versions. That could have helped Speedball last longer, but still a little repetitive. The only knockout mode will give some challenge though before you learn to choose your powerups wisely. The two player mini-league is funny if you have someone to play with. The game will keep track of points and goal difference for the duration of 10 ten games, but still it doesn't compensate for the absence of a true league mode, or even the ability to save and continue a knockout mode. This is too bad because I think the game is very funny. I think Speedball is a decent port of the original game and it's a hit and miss. Although it misses some features it is still funny considering the Master System hardware capabilities, and is an alternative if you are bored by the other usual sport games.